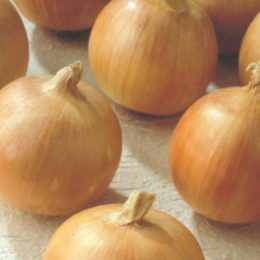 Australian Brown is a late maturing intermediate day brown onion selection. Bulbs are firm and globe-shaped and have a small root plate and thin neck. Hamlotte is a very early to early maturing intermediate day brown Pukekohe-selection that was bred in the Southern hemisphere. Bulbs are firm and uniformly globe-shaped with excellent keeping quality. Capricorn is a very early to early maturing intermediate day F1 hybrid, brown onion. The bulbs are uniform, very firm with a globe shape and attractive brown outer scales. Akamaru is an early to medium maturing F1 hybrid short day brown onion. The flattened globe shaped, golden brown bulbs are a uniform medium to large in size. Shinju is a very early to early maturing F1 hybrid short day brown onion. The globe shaped, golden brown bulbs are a uniform medium to small in size. Ayoba F1 Hybrid is an early to medium maturing variety with a late short day requirement. The variety have very strong growth habit and produces a high percentage of very uniform globe bulbs of a medium to small size and has a golden brown scales. Texas Grano 502 PRR is a medium to late maturing short day brown onion with an intermediate Pink root (Pt) resistance. The bulbs are uniform and have a granex shape. The scales are yellow, delicate and smooth. Red Creole is a medium maturing, open-pollinated short day red onion. Red Creole is well adapted and very widely planted.